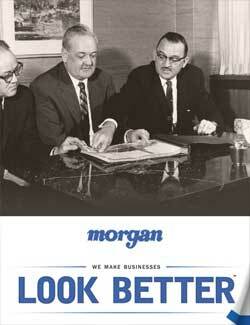 Morgan Services has served the hospitality, healthcare and image industries since the 1880s. Morgan Services has long believed that relationships matter. For example, the company has maintained long-term arrangements with Ellis, a manufacturer of washing machines and other laundry equipment; Tingue, Brown & Co., a global supplier and manufacturer of high-quality finishing equipment products; Fashion Seal, a leading producer of apparel for healthcare; Venus Textiles, which provides specialty product to meet unique customer needs. Those associations have helped Morgan Services toward its goal of servicing customers. But it’s not just anybody who makes the grade to work with an operation that knows its place in the industry and is quite content to pursue excellence in its own niche. Though it is largely regarded as a high-quality textile rental service that provides linens, apparel and other products critical to the hospitality and healthcare industries, operations at Morgan go far beyond, positioning it as a conduit through which those in hospitality, healthcare and environmental services source so much of the materials needed in their respective operations. The Morgan Services healthcare division is a supplier of scrub suits, lab coats, patient gowns, bed linens and towels. The Morgan Services hospitality division is a supplier of napkins, tablecloths, bedding, towels, washcloths and staff garments. The company maintains an extensive inventory of textile goods and other products for rent to the hospitality and medical industries, and the services it provides in the cleaning and maintenance of those materials has been distinguished for its best practices. It’s a long way from the outset, when Morgan Services was primarily known for fulfilling linen services to passenger trains. In the late 1880s, John Spoor, the cousin of Kendrick E. Morgan’s wife, tasked Morgan with the direction of a laundering business he had established in St. Louis. Morgan deployed horse and buggy teams to collect and deliver laundry it cleaned for the railroad enterprise of Wagner Palace Car Company. Spoor later became a manager at Wagner while Morgan continued to operate the laundry. 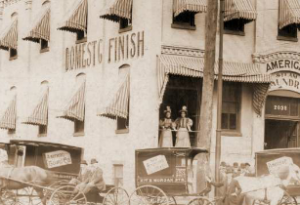 By 1889, Wagner merged with the Pullman Company and the laundry business was boosted in the process. After transitioning to a new home office in Chicago in the 1920s, it became known as Morgan Linen and Laundry Services, until principals simply settled for Morgan Services. Kendrick’s son, Alden Kendrick Morgan, ran the organization and was followed by his son, John Alden Morgan, whose leadership saw the enterprise transition into new areas of expertise. In fact, John Alden Morgan’s grandson, Alden Senior, now serves as managing director. Simmons said much of Morgan’s success stems from its flexibility and speed in responding to market changes. It provided laundry services for U.S. troops during the World War II era and also began its transition away from railroad services into the hospitality industry, where restaurants and hotels were attracted to cost-effective means of maintaining and cleaning their textiles on an outsourced basis. The same became true of hospitals, which were interested in handing off the strict regulatory responsibilities regarding material handling and eager to use the in-house laundry space for other functions, including patient care. Private physicians and their burgeoning specialty clinics followed suit in the 1970s and 1980s as well. These days, the company operates 36 locations across the U.S. – mainly in clusters that include coverage in and around Boston, Southern California, Cleveland, Dayton, Chicago, Northern Indiana, Western New York, New York City, Toledo and Detroit. It processes more than 65 million pounds of laundry per year, thanks to automated systems that perpetually monitor and measure efficiency. Its plants are accredited by the Healthcare Laundry Accreditation Council, which requires both a review of all operational systems and proof of adherence to strict laundering processes, including the way textiles are sorted and cleaned, the way air is circulated through a plant, the way water is filtered, the way workers come in contact with textiles and the way they are trained to perform protocols. Additionally, Morgan Services was the first coast-to-coast linen and uniform enterprise to achieve “Clean Green” certification from the Textile Rental Services Association, which has cited the company for achieving efficiencies in water and energy conservation and embracing best management practices for the reusing, reclaiming and recycling of resources. “We undertook accreditation to provide a level of assurance to hospitals that we’re processing linens in accordance with strict guidelines that assure delivery of a quality product,” Simmons said. WHERE: Headquarters in Chicago, Ill.